From left are AMES Human Resources Director Eric Salyer and Wilmington Rotary President Dan Evers. 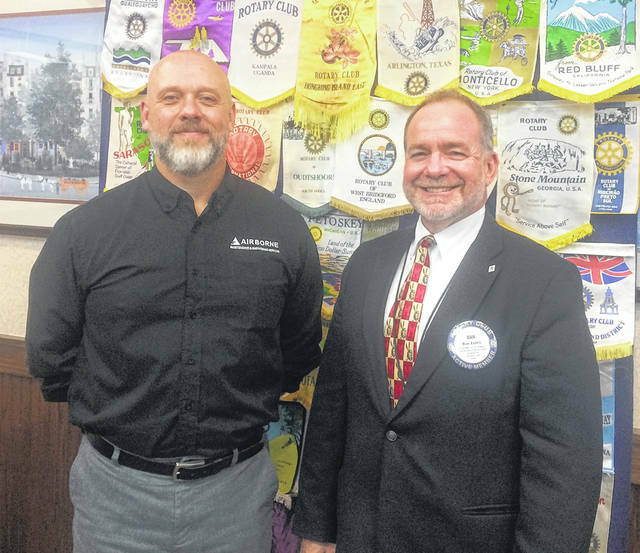 WILMINGTON — AMES Human Resources Director Eric Salyer spoke to the Wilmington Rotary Club which meets at noon on Mondays at Damon’s restaurant. Salyer said that AMES — Airborne Maintenance & Engineering Services — provides a fully integrated set of aircraft maintenance, repair and overhaul services for airlines and operators. They hold a Part 145 FAA/EASA Repair certificate and offer heavy maintenance, line maintenance, parts sales and service, component repair/overhaul, and engineering services. Salyer’s job at AMES is finding employees to work as airplane mechanics and a sheet metal mechanics. These are very technical positions and uncommon skills. Salyer stated that for every 15 mechanics leaving the industry, only four are taking their place. By the end of 2019, the need for aircraft mechanics will be at its greatest, and is expected to last for 10 years. To meet the demand, AMES has decided to train and build their own aircraft mechanic workforce by reaching out to middle school and early high school students and encouraging them to consider the technical school program for aircraft maintenance. AMES has also started an apprenticeship program. New employees spend 12 weeks in the classroom and workshops. The employee then moves to a 12-week program as the apprentice to a veteran mechanic. The goal at the end of the training is to test and pass the air frame licensure. AMES is also beginning to train airplane electricians. Salyer stated that AMES recruits in all 50 states and that the company currently needs 150 employees.